Golfers who give Liberty Hills a try will be pleasantly surprised. In over two years of new management by GreatLife, the 6,530-yard, par 70 course located a few miles east of Liberty, in a pastoral setting off Highway 69, has undergone important renovation. And membership is growing. The affordable membership plans begin at $49.99/month and the family membership is just $69.99/month. The pool opened Memorial Day weekend and provides a great opportunity for a fun family outing. Titus believes being a part of the GreatLife family is helping to increase interest in Liberty Hills. The golf course has an easy-going atmosphere. 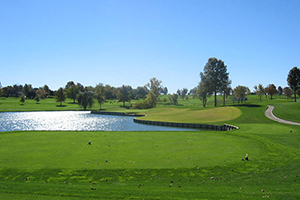 The facility features other amenities, such as the Pavilion, available for weddings, graduation parties, and banquets, plus men’s and women’s leagues, and, for the first time ever, Liberty Hills is participating in the Kansas City Cup. But it’s really the golf course itself which gives Liberty Hills its charm. Titus enjoys the challenges on numbers 8, 9, and 18. Number 2 used to be a par five, Zimmerman explained. Other holes have some challenge, too. Both Zimmerman and Neal joined Liberty Hills in October. While there are challenges along the course, there are also chances to score, too. Liberty Hills has something to offer a wide variety of golfers. One of the things which impressed the pair is the consistency of the course. Both Zimmerman and Neal like what they’ve seen so far. 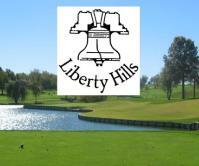 For more information about Liberty Hills, visit their website or call 816-781-3636. Sliding in the golf swing occurs when the lower body moves laterally toward the target during the downswing. If a lateral slide occurs during the downswing it is difficult to stabilize the lower body and eliminates potential power and speed. During the correct sequence in the swing, power is effectively transferred from the lower body up, not the upper body and down. Therefore, the correct sequence starts with the lower body transferring energy to the upper body while the upper body, arms and club uncoil through the forward swing. Without a stable lower body players lose power and inefficiently develop speed and power incorrectly. Many players think about the rotation of the pelvis by imagining their body in a barrel. The barrel prevents a lateral sliding motion, however it allows a hip rotation throughout the swing. The proper rotation of the hips eliminates a lateral slide. A lateral slide in the golf swing can be the result of a swing fault or physical limitation. There are several causes that lead to a physical limitation. The player must have the ability to rotate into the lead hip without any joint or muscular restrictions. Without the proper rotation a lateral slide will dominate the swing. Second, the lower body must create separation from the upper body. The correct separation creates a stable lower body and the correct rotation of the hips and upper body. Finally, the glutes help stabilize the lead leg during the downswing. The following drills and exercise will help teach the proper hip rotation and eliminate a lateral slide. 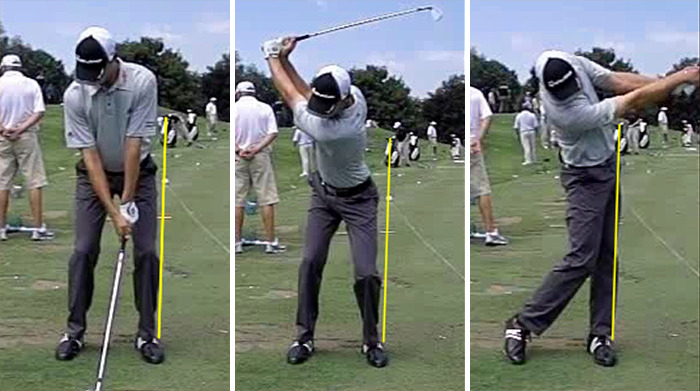 PGA Tour pro Sean O’Hair demonstrates the proper stabilization of the lower body and lead leg throughout the swing. If there is a lateral slide the lead leg and hip would pass the yellow line. Begin by addressing the golf ball in your normal set up. Next, open the hips and upper body slightly and allow the right knee to bend slightly and move a little closer to the left knee. This drill starts in the correct impact position, which begins with the left leg straight, left arm straight, firm left wrist and shaft leaning slightly forward. Next, simply swing the arms back and return to impact in the same position. Preventing a slide requires stabilizing the lead leg so the body rotates properly. Begin by taking your set up, however, place your right foot back and on the toe while the majority of your weight stays on the lead leg. Next, make a few swings and feel your hips rotate and maintain stable. The lead leg acts as a post while the front pocket rotates counter clockwise. If you try to sway during the drill you will lose balance and begin to fall forward toward the target. The Lead Leg Only Swing will help improve balance and prevent you from sliding during the downswing. This is a good exercise to feel the correct sequence and finish position of the golf swing. Place a club behind your neck with your hands on both ends. Stand with your feet shoulder width in an athletic set up position and rotate the left shoulder under the chin to simulate a backswing. Next, rotate the right shoulder to the left so the chest faces the target and the left leg is posted up in a straight line. The left leg should remain straight while the left hip rotates to the left. The upper body turns, left leg stays straight and left foot remains flat while the right heel comes up off the ground and the body turns to the left. 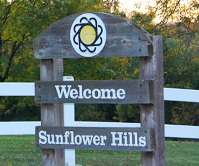 When Kansas City-area golfers talk about a good place to play, Sunflower Hills is always in the discussion, and for a number of reasons. The friendly staff boasts more experience than any other course in the city and as a municipally-owned course, it has maintained a clientele-friendly pricing system. Most importantly though, the course offers plenty of challenges for a wide variety of golfers. 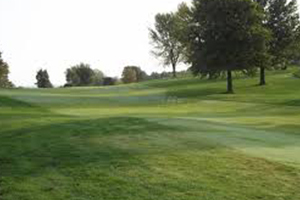 The par-72 course, located at 12200 Riverview Avenue in Bonner Springs, near the Kansas Turnpike, measures 7,032 yards from the championship tees and features rolling zoysia grass guarded by several hazards. Unlike many area courses, Sunflower is not situated in a housing development. The course can be challenging enough for golfers of any level. Players will find the most challenge from #6, a par five and the longest hole on the course at 551 yards. It’s also rated as the toughest. But if that’s not enough for golfers in search for a challenge, they will also enjoy taking on #15. Other holes present their own challenges. Although the greens are large, their elevation changes and rolling style make for an interesting putting challenge. The challenges presented by Sunflower make it a popular place to play, as does the competitive pricing. 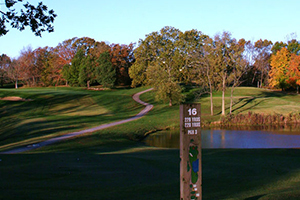 Being owned by the government of Wyandotte County, the course strives to be accessible to all players. 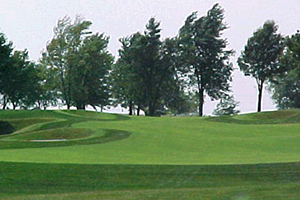 To make the course especially accessible, Sunflower has five sets of tees. 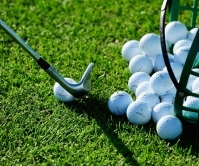 The combination of good golf and good prices, along with having a variety of tees, have made the course attractive to players of all ages, as reflected in the large number of seniors and juniors who play at Sunflower. Sunflower hosts a large senior league with 160 members playing on Wednesdays and another 30 on Mondays. The course is also a popular place for youth golf. 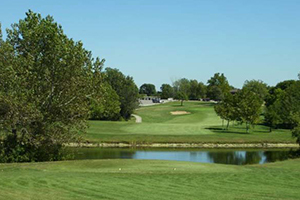 Sunflower is also host to one of the best and oldest local tournaments, the Wyandotte County Open. The tournament is open to everyone and will be celebrating their 40th year in 2016. “It’s open to anyone that plays the game,” Johnson said. “All they have to do is come out and shoot the ball and we’ll place them in a flight. We have a wide variety of golfers for that. It’s our signature event and we go after a wide variety of people. We have men’s championship flight, five flights for the men and two flights for the women. We get anywhere from 90 to 110 players every year for that. 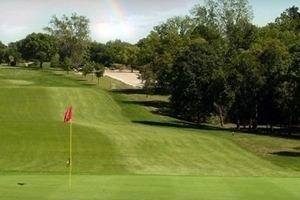 Another reason for Sunflower’s popularity is the well-maintained course and experienced staff. Johnson has worked at the course for 35 years and the grounds crew is one of the most experienced in the city. That experience reflects itself in the condition of the course. For an enjoyable round of golf, it’s hard to do better than Sunflower Hills. 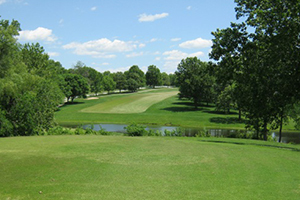 For more information about Sunflower Hills, visit www.sunflowerhillsgolfcourse.com or call the clubhouse: 913-573-8570.